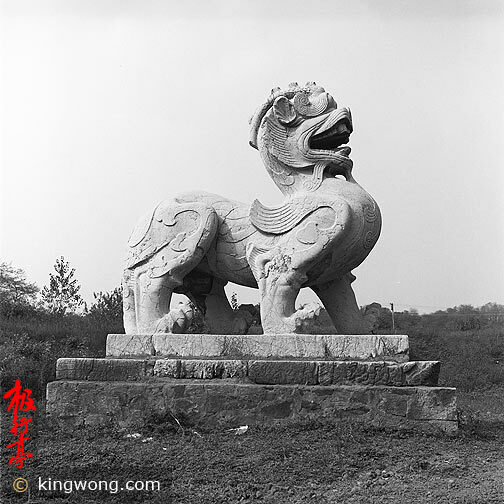 Qilin is a Chinase mythical animal that were mentioned early in ancients texts such as the Book of Songs, Zhou Nan, Book of Rites, and others. Its appearance signifies the coming of an exceptional figure(such as the during the birth of Confucious) or a phenomenal change. The traditional description of a qilin is that it is a yellow beast with a body of a deer, the legs of a horse, the paws of a wolf, the tail of a cow, and one horn(or two horns). The Western unicorn, which qilin is often translated as, has a head of a horse, the hind legs of a stag, the tail of a lion, and a single horn in the middle of the forehead( from Webster's Dictionary). The qilins in this farm don't exactly fit the description. They look more like lions with unusual heads.